Chomeiso (cho-may-so) is a well-known, traditional herb on the island of Okinawa but virtually unheard of outside of Okinawa, Japan. It is also known as ‘Sakuna‘ in Japanese, but there is no English name assigned to the plant due to its rarity! Chomeiso has only in recent years been researched for its compounds and health effects. The results are surprising and may be a big factor that contributed to Okinawan’s renowned longevity and health. For decades, the Okinawan people used this plant to treat cough, cold, and fever. It is used in dishes such as miso soup, tempura, and sushi garnishing. Chomeiso is gradually being realized to have great health effects and to be a big contributor to weight loss and maintenance. (click the word ‘study’ to see more information about the research). Chomeiso is found to have the strongest radical scavenging activity among a group of researched subtropical plants in a study taken by the Division of Health and Food Sciences, Kyoto University, Japan. Its anti-oxidant activity is proved even further by this study also published in the Journal of Agriculture and Food Chemistry. When a plant has a strong anti-oxidant activity that means it contains components that can interact and neutralize free radicals. Free radicals cause damage to other cells, especially cell DNA, which may be a major factor in the cause of cancer. Chomeiso has a component called coumarins that have anti-platelet aggregation activity shown in a study by Medical and Pharmacological Institutes in Taiwan. Platelet aggregation is the clumping together of platelets in the blood and a part of the events that lead to a blood clot. Blood clots lead to stroke, heart attack, and other diseases. A plant that has anti-platelet aggregation activity means it decreases platelet clumping and inhibits blood clot formation, overall being a food that contributes to the prevention of strokes and heart attacks. This study conducted in Tokyo, Japan showed Chomeiso to lower blood pressure and increase blood flow, important factors in preventing blood and blood pressure-related diseases. This study taken in Taiwan showed Chomeiso to show activity against lymphocytic leukemia system in cell cultures. Chomeiso has shown anti-cancer activity in this study conducted by Medicinal and Research Division in Gifu and Okinawa, Japan. Chomeiso indicated chemopreventive effects on the first stage of colon cancer by inhibiting free radicals and rapid cell multiplication activity. However, in this study another discovery was made: the rats given Chomeiso showed a significant amount of weight loss. In this study, two groups of rats were given a high-fat diet. Chomeiso powder was given to one group of rats and not to the other. The group given the Chomeiso supplement showed the highest suppression in body weight, abdominal, and subcutaneous fat. They also had reduced serum leptin levels which lead to decreased adipocyte volume, or fat storage volume. How does Chomeiso have these weight loss effects? Pteryxin, among many other anti-obesity compounds in chomeiso, is a compound found to prevent and/or decrease the amount of adipose tissue and adipocytes, or simply known as fat and fat cells. Being overweight or obese is one of the leading causes of type 2 diabetes, heart disease, osteoarthritis, sleep apnea, certain types of cancer, and, for many, a hindrance in everyday activities. Chomeiso shows to be a plant that may relieve the excessive build-up of fat tissue, assist weight loss, and a key part of the diet for keeping health. and 4 times more calcium than milk. It also has plenty of polyphenols, which are known to help in preventing heart disease, high blood pressure, diabetes, and cancer. 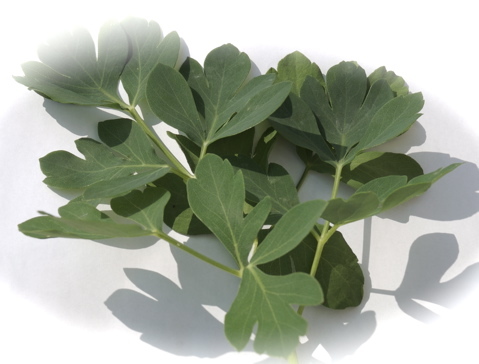 Chomeiso is an up-and-coming, nutritional plant, hardly known to the western world. Keep an eye out for it as it will be seen more often in the near future! -下地, 清吉. 琉球薬草誌. 1st ed. 沖縄県: 琉球書房, 2015. Print. -Nugara, Ruwani N., Masashi Inafuku, and Hirosuke Oku. “Peucedanum japonicum Thunb and its Antiobesity Effects: Evidence and Related Mechanisms.” 脂質栄養学 25.2 (2016): 177-196. -Takeuti, Naoki, et al. “Pharmacological activities of the prenylcoumarins, developed from folk usage as a medicine of Peucedanum japonicum THUNB.” Chemical and pharmaceutical bulletin 39.6 (1991): 1415-1421. -“資生堂 長命草（ボタンボウフウ）”. Shiseido.co.jp. N.p., 2017. Web. 7 Apr. 2017.